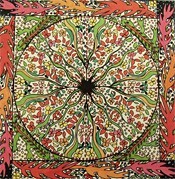 Get away from the daily grind tonight, when you connect with your inner self at Meditative Drawings: Mandalas in Brecksville. Used by Tibetan monks and Buddhists alike, mandalas are all about making art out of circles — like cutting one into eight pie slices and finishing the piece with simple or complex patterns. "You sit and ponder over the circle. You actually meditate while you draw, while you finish the piece — and in front of it when you hang it on the wall," says Stephanie Sibits, the class' instructor. "It's a relaxing, calming creation. "There are no set patterns or color-by-number guides. Every line, says Sibits, is determined by you. During the sessions, you're encouraged to delve deep into the process and forget about time constraints. "You get away from the chatter of life. It's like when the right side of the brain kicks in and you go into an almost unconscious state," says Sibits. "You're not aware of your surroundings, and what you create depends on what kind of person you are." Classes run from 6 to 8 tonight, Friday, Monday, Wednesday, and Friday, July 16, at the Brecksville Center for the Arts, 8997 Highland Drive in Brecksville. Fee is $50 for center members and $55 for nonmembers. Call 440-526-6232 or visit www.brecksvillearts.org.